I have convinced myself that the illustrated mushrooms, found in southern Illinois under eastern white pine, represent Laccaria trichodermophora--but I wouldn't swear they are not some other species of Laccaria in the Laccaria bicolor (or even the Laccaria laccata) "complex." My collection, however, is useful for demonstrating one of the major hurdles of Laccaria identification--so I am sharing my pain with you in order to help you avoid having a similar experience. In short, the lesson to be learned is: take note of the color of the basal mycelium of young specimens. This morphological character is often the best naked-eye feature for narrowing down identification possibilities. If you have, for example, collected a bunch of pretty little Laccaria species under white pine in southern Illinois without paying much attention to them and, to pull another completely random example out of mid-air, you have failed to record any decent color information in your journal--and, to continue the, um, hypothetical, it is now February and you think you are going to be able to identify your mushrooms . . . you get the picture. Have fun with your microscope and at least half a dozen potential matches. 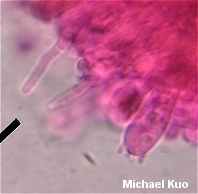 Assessing spore dimensions, shapes, and the morphology of the spines that ornament the spores, in theory, will eliminate many choices--and several species in Laccaria can usually be eliminated on the basis of their ecology (some species appear to occur only in limited areas under certain trees). But in the case of the illustrated mushrooms, I ultimately had to resort to analysis of the cells on the surface of the cap; in Laccaria trichodermophora these cells are gathered into erect bundles that are so tightly packed together that they almost can't be distinguished as bundles, and appear as a "trichoderm" (a perpendicular arrangement of interwoven cap surface cells ). You are welcome to use the illustrations to the right as examples--but bear in mind that my microscope skills are limited, and that the illustration could easily represent something else (say, fibers from my sweater). Ecology: Mycorrhizal with pines (Pinus species); growing scattered or gregariously; fall and winter; from southern Illinois to the Gulf Coast, east to the Carolinas. Cap: 1-7 cm; convex, becoming flat and sometimes uplifted; the margin often inrolled at first, later straight and wavy but never lined; hairy to finely scaly at first, later more prominently roughened or scaly; brownish orange to reddish brown. 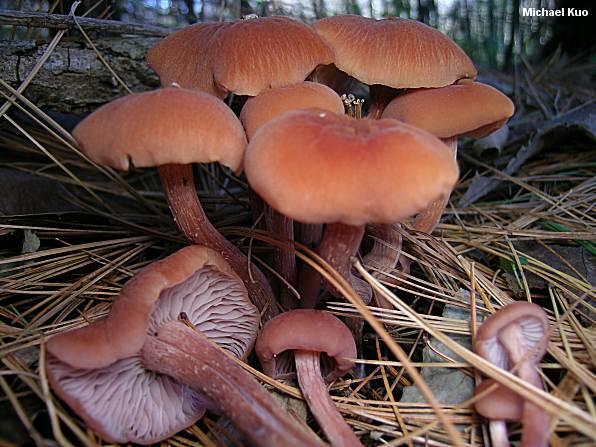 Gills: Attached to the stem; close or nearly distant; pinkish flesh color. 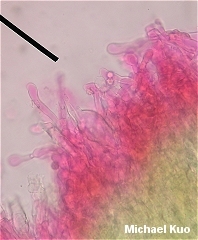 Stem: 2-12 cm long; up to about 1 cm thick; equal or with an enlarged base; hairy and sometimes longitudinally lined; colored like the cap; with purplish basal mycelium that soon fades to whitish. Flesh: Thin; pinkish flesh colored. Microscopic Features: Spores 7-9 x 6-8 µ; broadly elliptical or subglobose; ornamented with spines mostly 1-2 µ long; inamyloid. Basidia 4-spored. 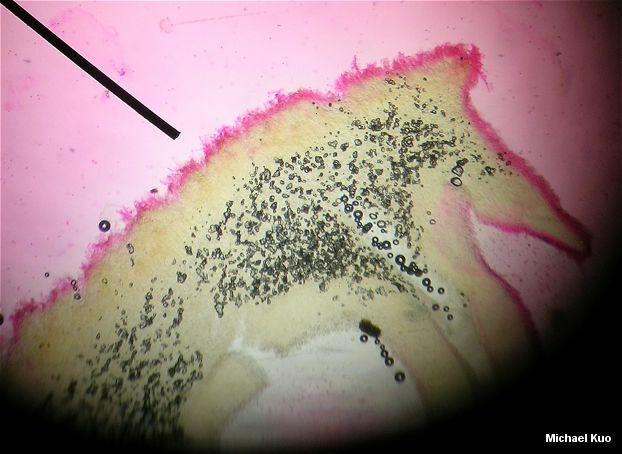 Cheilocystidia usually present; filamentous; to about 60 x 7 µ. Pileipellis with densely packed fascicles of erect elements 6-30 µ wide (appearing as a trichoderm); terminal cells subclavate to capitate. REFERENCES: Mueller, 1984. (Mueller, 1997.) Herb. Kuo 11060404.